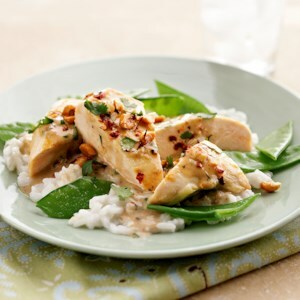 Find healthy, delicious peanut butter recipes, from the food and nutrition experts at EatingWell. 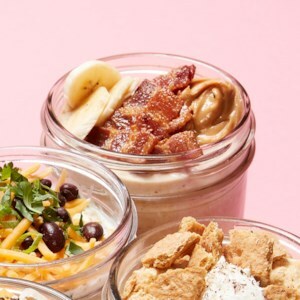 Peanut butter and curry flavor this savory overnight oats recipe. The healthy breakfast is easy to prepare and perfect for anyone who loves oatmeal, but doesn't have a big sweet tooth. 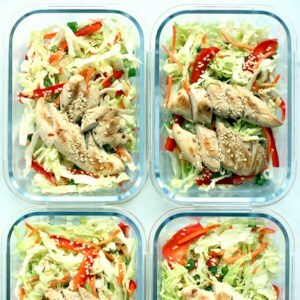 Plus, it's a great way to sneak some extra veggies into your day. 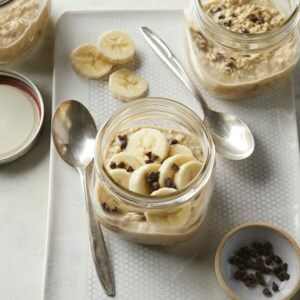 We've taken classic Elvis-sandwich flavors--banana, bacon and peanut butter--and stirred them into easy overnight oats in this healthy breakfast recipe. 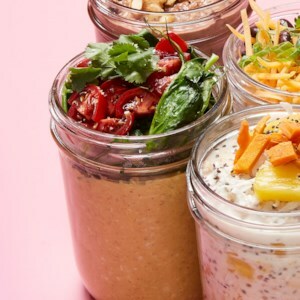 Make a bunch of jars at the beginning of the week for ready-when-you are morning meals all week long. 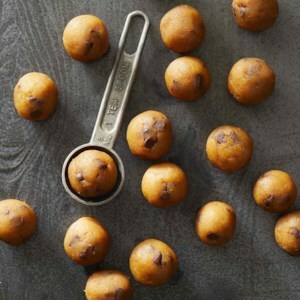 Most raw cookie dough isn't safe to eat, but this recipe for vegan edible cookie dough is designed to be eaten raw. Canned chickpeas and nut butter form the base of this dough, making it healthy too! 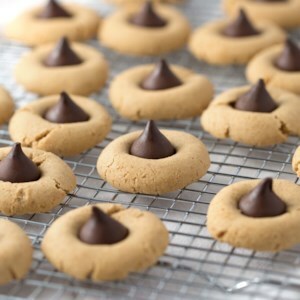 In this recipe, we roll the dough into little bite-size balls, perfect for snacking. Keep a stash in your freezer for a healthy treat. 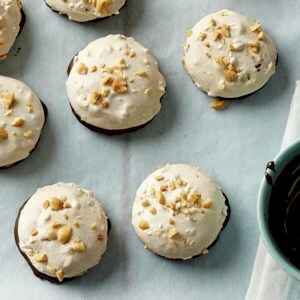 Smooth and creamy, these two-tone desserts are rich in flavor but low in fat because they're made with reduced-fat peanut butter and fat-free half-and-half. 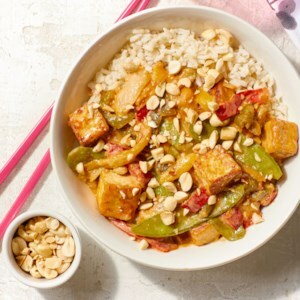 Chicken satay moves from classic Thai restaurant appetizer to delicious homemade dinner with this easy meal-prep recipe. 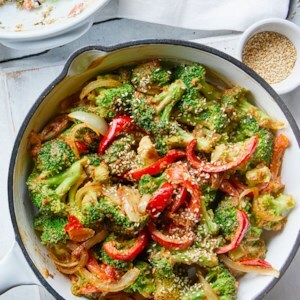 A crunchy Asian-inspired slaw serves as the satisfying low-carb base, and the bold, creamy peanut sauce brings a hint of heat to every bite. 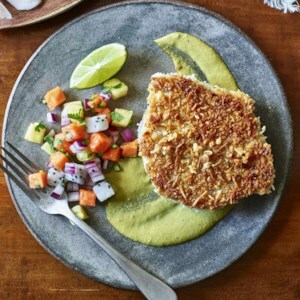 A fragrant peanut sauce sends this tropical tuna recipe over the top in terms of flavor power per bite. To make the sauce quickly and easily in a blender, we've bumped up the volume of ingredients, so you'll have some leftovers. 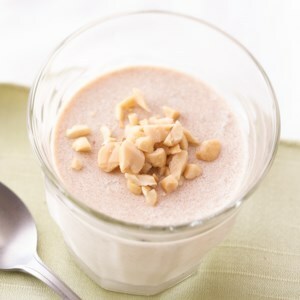 The sauce works great for making peanut noodles or as a dipping sauce for just about anything. Recipe adapted from Chef Greg Harrison, Pacific'O Restaurant. 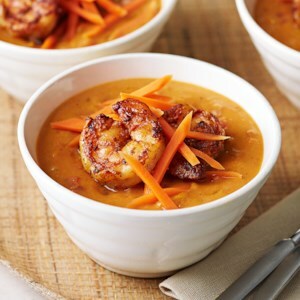 This Moroccan-inspired soup is made with roasted butternut squash and tomatoes, flavored with creamy peanut butter, and topped with zesty shrimp and julienned carrots. 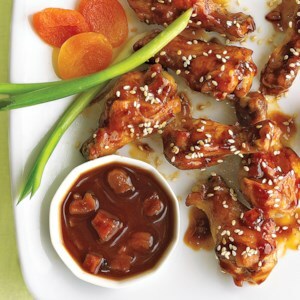 It's a beautiful appetizer to serve to guests--and they'll love the taste! This sweet snack takes peanut butter and jelly to new heights and it's perfect for serving at your kids' next play date or party. 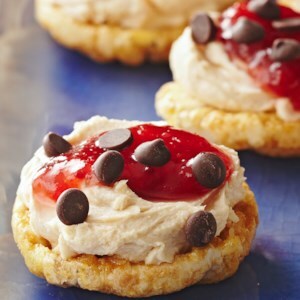 Miniature sweetened rice cakes are topped with a peanut butter-cream cheese blend, sugar-free fruit preserves, and chocolate chips--the kids will love it! 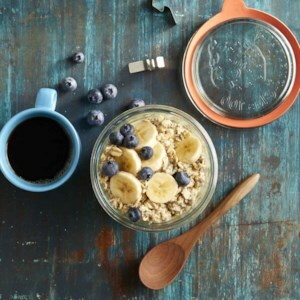 It takes just a few minutes to prepare these overnight oats and you will be all set with 4 packable healthy breakfasts to enjoy throughout the week. 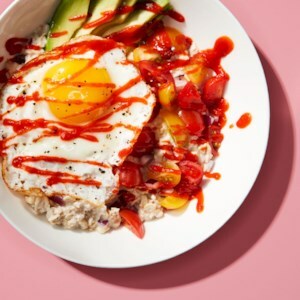 Use whatever milk you have on hand for this easy meal-prep breakfast recipe. 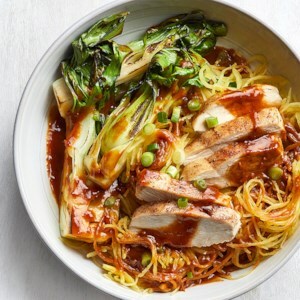 Chinese five-spice powder, a blend of cinnamon, cloves, fennel seed, star anise and Szechuan peppercorns, adds a hint of warmth and the suggestion of sweetness to this healthy chicken recipe. It's great on just about anything you grill or roast, so it's worth keeping in your spice cabinet. 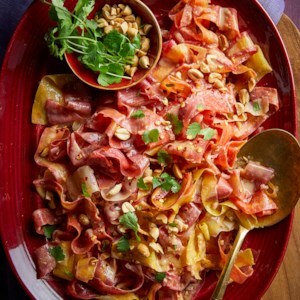 Thinly shaved carrots stand in for wide rice noodles in this Thai-inspired low-carb "noodle" dish. Try using red, purple, or yellow carrots for a colorful twist.